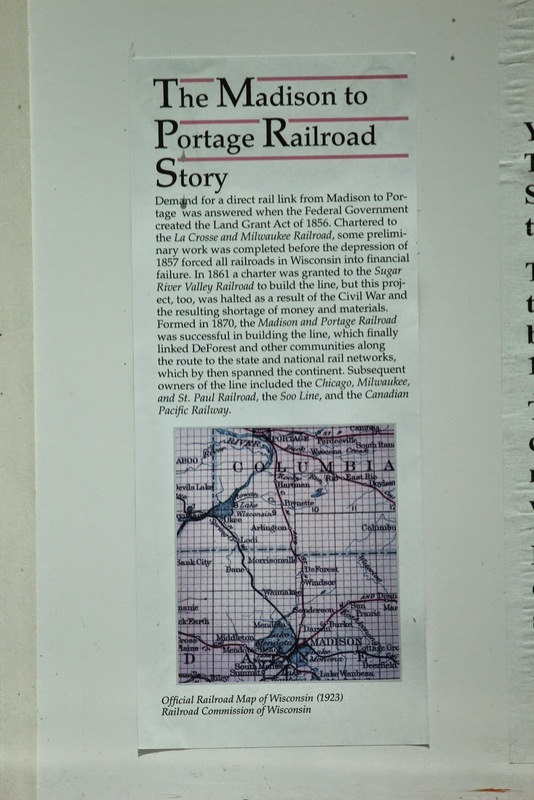 The DeForest Depot was built in 1871, at the time of the construction of the railroad line which connected Madison to Portage. Land for a depot was donated to the railroad by Isaac DeForest. Recognizing the importance of rail service to the growth of the community, area residents provided funds to erect the building. Knute Knudtson, a local tradesman, constructed the depot using a post and beam building technique common to many area barns. The original exterior siding consisted of vertical boards and battens. In the 1920s the depot was remodeled to include wainscoting, horizontal siding, and new windows. The DeForest Depot closed in 1971 and the building was later purchased by the Chase Lumber Company of DeForest to be used for storage. 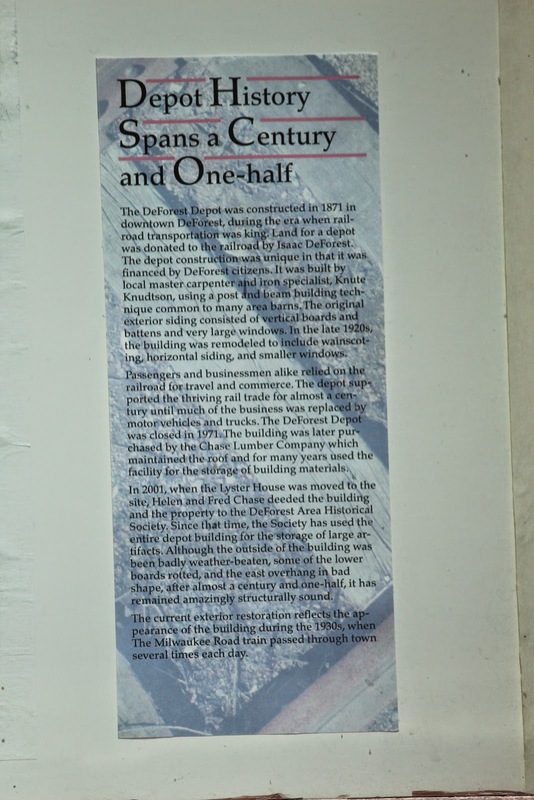 In 2001 the land and the building were deeded by Fred and Helen Chase to the DeForest Area Historical Society. The current exterior restoration reflects the appearance of the building during the 1930s, when The Milwaukee Road train passed through town several times each day. This restoration project was made possible through the dedication, generosity, and gifts of many. 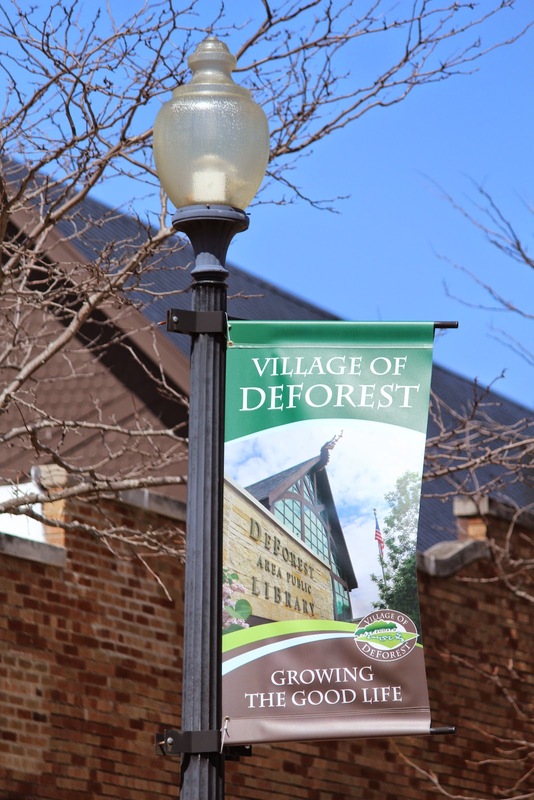 Special appreciation is extended to the DeForest Depot Restoration Committee and to Society members and friends. The DMB Community Bank, the family of Robert and Dorothy Ethun, and the Village of DeForest (Fred and Helen Chase Fund) for significant financial support. The depot and marker are located on northbound Market Street, between Pleasant View Street (to the south) and Commerce Street (to the north), at 215 Market Street, DeForest, Wisconsin 53532. The depot is maintained by the DeForest Area Historical Society. The exterior of the DeForest Railroad Depot has been completely restored to its 1930's appearance. The marker is on the north side of the depot . . . The tracks, on the east side of the depot. The south side of the colorful depot. The east side of the depot. Gorgeous home directly across the street from the Depot. The Depot is located in DeForest, Wisconsin.